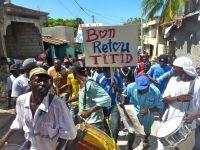 PORT-AU-PRINCE, Mar 17 2011 (IPS) - Tensions are running high in Haiti as dueling campaigns for the presidency enter overdrive in their final days, and Jean- Bertrand Aristide, a popular former president, returns from a seven-year exile in South Africa. Aristide will arrive in Port-au-Prince on Friday morning, Ira Kurzban, his Miami-based lawyer, told IPS in an email message. A private plane carrying his family left Johannesburg on Thursday. “There were people who conspired to send him away, and if there is tension it will be because of them,” he said. Aristide was flown out of Haiti in 2004 on a U.S. plane in what he called a modern-day coup d’etat. The George W. Bush administration and critics say his rule was marked by corruption and human rights abuses until he voluntarily fled into exile amidst a rebellion. Diplomatic communications released by Wikileaks show that the administration pressured other countries to limit Aristide’s political influence from abroad. But last month he was given a renewed passport by the Haitian government and this week South Africa rebuffed pressure from Washington to prevent his return. Fanmi Lavalas, Aristide’s party, was banned from participating in the electoral process by Haiti’s electoral council. “They are not planning to have free and fair democratic elections. They are planning to have a selection,” Aristide told an interviewer last fall, a talking point echoed regularly by his supporters at demonstrations. In a Thursday press release, the U.N. peacekeeping force said “there is no doubt” Haitians will go to the polls to determine the future of their country, and urged them to exercise their vote en masse. Privately, a U.N. security advisor sent out a “hibernation checklist” to foreign aid workers to prepare for possible riots. Mirlande Manigat and Michel Martelly, two right-wing candidates at the opposite end of the political spectrum from Aristide, are vying for the presidency in Sunday’s runoff election. The victor will manage Haiti’s reconstruction, including billions in funds promised by international donors. “The elections are costly and the Haitian people need to make a choice without any major disruption. [Aristide’s return] would certainly be a distraction, on the eve of the election,” Alice Blanchet, an advisor to Haiti’s prime minister, told IPS. “The rest is not in our control and it’s up to him,” Blanchet said. Both presidential candidates softened their stance towards the former leader this week, saying he has the right to return before the vote takes place. Some are still calling for the vote to be annulled and re- started. Ginette Cherubin, a member of Haiti’s Provisional Electoral Council (CEP), revealed that she and three other members, out of eight, never agreed to the announced results pitting the two candidates against each other. A majority of the council is required to take a decision. Richardson Dumel, a CEP spokesman, refused to confirm that a majority of the body’s members signed the results, saying repeatedly he could not comment on it or Haiti’s electoral law. Presidential candidate Jean Henry Ceant, who came in fourth in the initial results, demanded the CEP provide a copy of the results to a Haitian court. The document, delivered by Dumel, bears a CEP stamp but no signatures. Ceant maintains the election is illegal. The candidates have starkly different public personas. Manigat is an elderly, soft-spoken professor; Martelly a boisterous konpas singer. But they have remarkably similar political platforms, including a key promise to reconstitute the Haitian Army. Martelly especially is seen as having had close ties to the military. He ran a lounge that was a hangout for Army leaders who violently opposed Aristide during his first term and was good friends with Michel Francois, a notorious coup leader who was indicted for drug-trafficking. A video posted on YouTube last month appears to show Martelly strutting around a nightclub, threatening Aristide and calling his supporters “faggots”. Gerardo Ducos, a Haiti researcher for Amnesty International, said the human rights group has “great concern” about reinstating the Haitian army. “The question that needs to be asked is, why? Why does Haiti need an army?” Ducos said, pointing to the existence of the Haitian National Police. “Bringing the spectre of the Haitian Army back to life is yet another blow to the memory of victims and survivors of crimes and grave human rights abuses committed by this institution until it was disbanded in 1995 by President Aristide, and again in 2004 during the rebellion led by former [Army] officials,” he said. A media specialist for Mirlande Manigat admitted privately that Martelly had captured the support of the southern and western sections of Haiti, but maintained Manigat is highly popular in the rest of the country. In some areas of the crowded capital city, there is palpable enthusiasm on the streets for Martelly. Adults and children salute each other with an upbeat “Tet Kale!” the humorous play-on-words slogan for the campaign. New banners have been strung up hailing Aristide’s return, amidst Martelly’s beaming grin on ubiquitous bright pink posters lining the streets. “It killed the stereotype that he only has crowds behind him and that we’re not educated, we’re not intellectuals,” music star Wyclef Jean told IPS after a recent debate between the presidential candidates. A pro-Manigat demonstration outside the debate dissipated after exchanging verbal barbs with Martelly supporters. Jean will perform Thursday evening in a pro-Martelly concert near the shattered national palace. He publicly supported the rebels who sought to overthrow Aristide in 2004, but said he welcomed the former president’s return.